Sunday, May 3, was one of those days simply made for poetry. Blue skies, dazzling sunshine, and a walk through land virtually untouched by humans. A Carolina day free from humidity is truly a gift! Our writing group was fortunate enough to have the opportunity to visit with Robin and her husband Wayne, a walking encyclopedia of history and natural science, especially forestry. They are the stewards of one of the dwindling parcels of land not yet affected by the growing development in Chatham County. Wood sprites, fairies, or poets? What do you think? Their land includes a natural spring, Landrum’s Creek (home to river otters! ), and New World trees rarely seen in subdivisions these days: beech, ash, red oak and hickory. 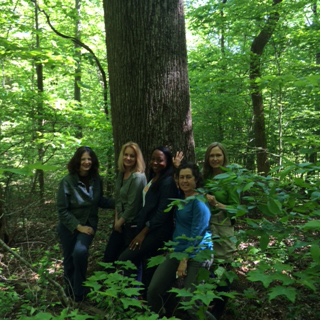 Here we are posing in front of an estimated 250-year-old mockernut hickory tree (identified, of course, by Wayne). Nature walks, a ritual prescribed by Susan Wooldridge in her book Poem Crazy, are like oxygen to poets. Susan recommends regularly immersing yourself in nature and learning the names of flora and fauna. While we didn’t get lucky enough to see an otter (be still my heart…can you imagine? ), we did spot a skink, a hawk, butterflies, centipedes, woodpeckers, and the one thing that makes you dread warmer weather: ticks! But even these pesky little creatures have earned their place. Hummm….a poem about ticks, now there’s a subject rarely touched. Robin was an especially thoughtful hostess, as she and Wayne had thought ahead and plunked down a brand new picnic table right in the middle of the clearing. This was a perfect spot for pita chips, hummus, ginger ale, and what else? Strawberry shortcake! 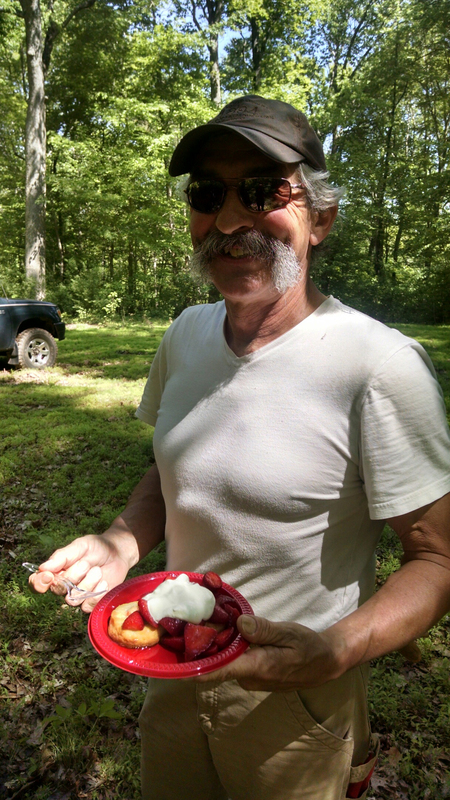 Here is Wayne, our intrepid field guide, who is enjoying his own well-deserved plate of cake. We are so grateful to him for his willingness to lead us through the woods and answer our endless list of questions? Is this a maple? Why is this bark so rough? Can we drink from that spring? I’ll give his answer to the last question, mine, out of due diligence. Sure, he said, if you’re used to all those microbes in your system. That was enough for me! Shortcake was certainly in order given our group’s recent accomplishments. We found out that Carolina Crimes: 19 Tales of Love, Lust, and Longing, which includes a story (“Happy Pills”) by our writing group member Linda Johnson was nominated for a 2015 Anthony Award. 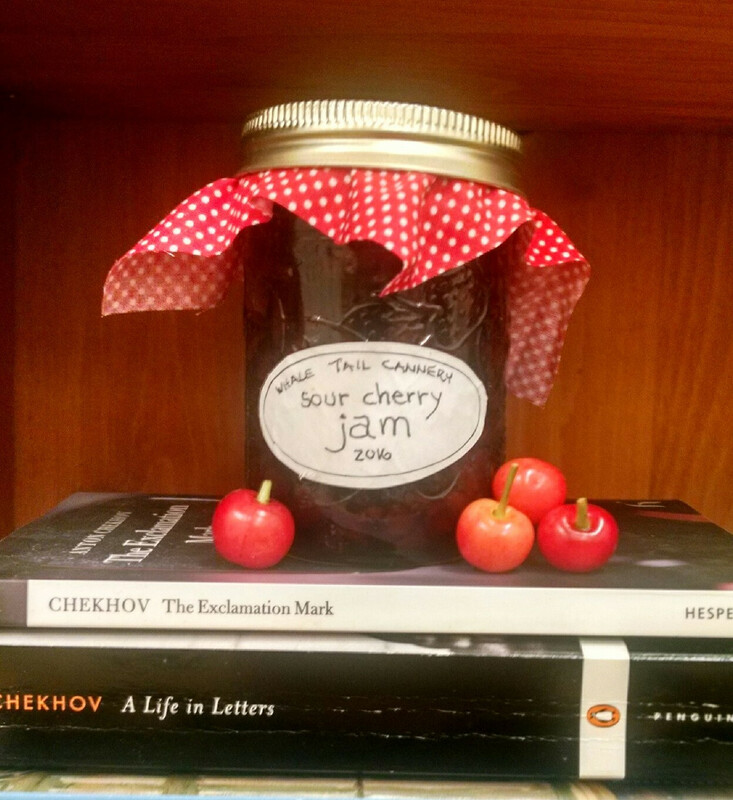 This anthology was edited by local writer and editor Karen Pullen and includes tales from other acclaimed writers such as Ruth Moose, one of our group’s favorite writing teachers at CCCC. And….just in time for Mother’s Day, we also learned that another member, Michele Berger, had a piece of her writing selected for a national anthology: A Letter to My Mom: A Tribute to Our Very First Loves. In this beautiful book, Michele shares her own heartfelt message to her mother in a collection of personally-crafted letters written by people from all walks of life, including celebrities (Dr. Phil, Suze Orman, and Mariel Hemingway, just to name a few!). Read more about Michele’s experience on her own blog. What I love about this book is that it represents just a fraction of a community of people who want to express their love and admiration for their mothers. In fact, you can even share your own letter on their website. Whether it’s walking in the woods or celebrating your own mother, I hope that you will find your own inspiration in your own space and that the writing flows as freely as it does in Landrum Creek! This entry was posted in Uncategorized and tagged A Letter to My Mom, carolina crimes, cccc, central carolina community college, chatham county, happy pills, landrum's creek, Linda Johnson, michele berger, mockernut hickory tree, nature, poem crazy, poetry, ruth moose, strawberry shortcake, susan wooldridge, woods on May 4, 2015 by Ashley Memory.